Should you add peacocks to your homestead? An India blue peacock at 4Ds Farm in Maine. With its dazzling fan of colorful feathers, the peacock is the prima donna of domestic birds. Strutting about the yard, it demands attention, its iridescent feathers shining in the sun. “It’s like having a walking flower garden,” Bill Benner, a peafowl breeder from Massachusetts whose experience with the bird stretches back to the late ’60s, said. The majority of peafowl bred in the U.S. are India blue peafowl, which come from India. This species of peafowl is extremely hardy, making it well-suited for even the northernmost reaches of the country. The typical India blue peafowl has a long vibrant blue neck and head, with an elaborate tail of greens, gold and blue. However, over the years, the species has been selectively bred to produce a variety of other colors, including an all-white variety, a brown and tan variety, several pied varieties and a black-shouldered variety. These are all just mutations of the same species. In addition, an entirely different species of peafowl called the green peafowl is also bred in the U.S., though it’s not as common. This species, originating from southeast Asia, are not as tolerant of the cold, so they require heated shelters in northern states. The birds’ beauty, Benner said, is one the primary reason people raise them in the United States. Yet some farmers have discovered that peafowl — for which “peacock” is the term for male and “peahen” is the term for female — can fill a few other roles on their property. A bronze pied peacock at Rhineland Acres in Massachusetts. In addition, peafowl consume a variety of insects, as well as snakes, amphibians and rodents. So some people use them to help keep pest populations under control. However, peacocks will also consume flowers, vegetables and other items on your property that you may not be so happy about. Before investing in your first peachicks, there are a few things you should consider. Can you eat peafowl meat or eggs? Peafowl eggs, while edible and nutritious, are far too expensive to be marketed regularly as food. In the U.S., one peafowl egg typically costs between $25 and $100. Furthermore, peahens only lay an average of 20 eggs per year. And peafowl meat, while commonly consumed in several Asian countries, is not in high demand in the U.S. — and is also quite expensive. Before purchasing peafowl, make sure local zoning laws permit the bird. Just because chickens and other poultry may be permitted in your neighborhood doesn’t mean peafowl are. Often this bird is considered separately by law makers because of its tendency to cause a nuisance to neighbors by wandering, making loud noises and damaging property. For this reason, peafowl are often kept inside large enclosures. Fett suggests a wire enclosure of 12 feet wide by 16 feet long by 8 feet tall, with a closed-in top. Peafowl are skilled flyers and will escape if given the opportunity. They also need room to fan out their plumage during mating season, which can reach over 6 feet tall. Peafowl need to be provided with places to roost, and these perches should be 4.5 to 5 feet off the ground so their long tails don’t touch the ground, Fett said. This will prevent mice from gnawing on the birds’ feathers at night. Roosts also help peacocks weather the cold. A white peacock at Rhineland Acres in Massachusetts. In addition, in cold climates, peafowl should be provided with a shelter, such as a large coop, a shed or a barn that they can retreat into when it’s especially cold outside. And this shelter should also have perches available for them to sleep on, DeMoranville said. 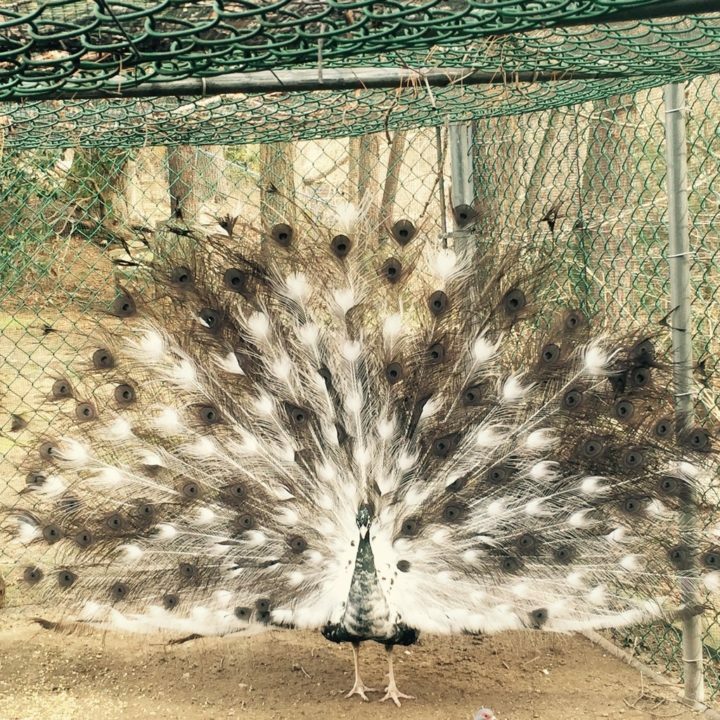 Some people do choose to allow their peafowl to roam their property, free of an enclosure. If you plan to do this, Fett suggests you keep your peafowl in an enclosure for at least a year so they understand where to return to for food and shelter. And still, you may find that your peafowl wander off your property. The male of the pair quickly returned, but the female was gone for three days before they discovered the bird at their neighbors. Another reason to keep peafowl penned in is the birds’ susceptibility to parasites, especially parasites carried by chickens and wild birds. Allowing them to roam in proximity to other animals may cause them to develop diseases, such as the often fatal Blackhead disease, often passed to peafowl by chickens. For food, DeMoranville feeds his peacocks high-protein poultry feed and supplements it with game bird feed, black oil sunflower seeds and sometimes biotin and other additives. During the warmer months, they’re fed grass and dandelion greens, and during the winter months, he periodically feeds them kale or spinach. But peacocks aren’t picky, and much like chickens, they’ll eat a wide variety of food. DeMoranville was given his first pair of peacocks by his father when he was about 10 years old, back in the late 1970s. His family lived near Cape Cod, and at the time, peacocks were fairly rare in that area. “Not many people had them, and I thought the color was striking,” DeMoranville said. Over the years, peafowl grew in popularity throughout the country. They were especially sought after by the rich to adorn their gardens and lawns. A pied peacock at Rhineland Acres in Massachusetts. Fett and his wife Debra Buck purchased their first peafowl in 1980, and quickly established themselves as experts on the bird, self-publishing two books on peacock care in the ’80s, and launching www.peafowl.com in the mid-1990s. On their farm in Iowa, they’ve raised and sold thousands of these elaborate birds. To continue to spread enthusiasm and information about peacocks, Fett created a YouTube channel devoted to peacocks in 2008 and has since published about 400 videos starring his birds. 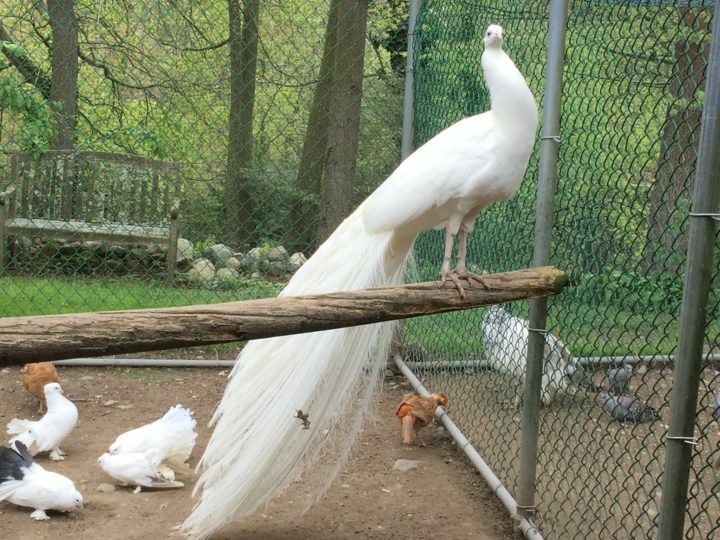 While peafowl can be a beautiful addition to a homestead or farm, they aren’t for everyone. 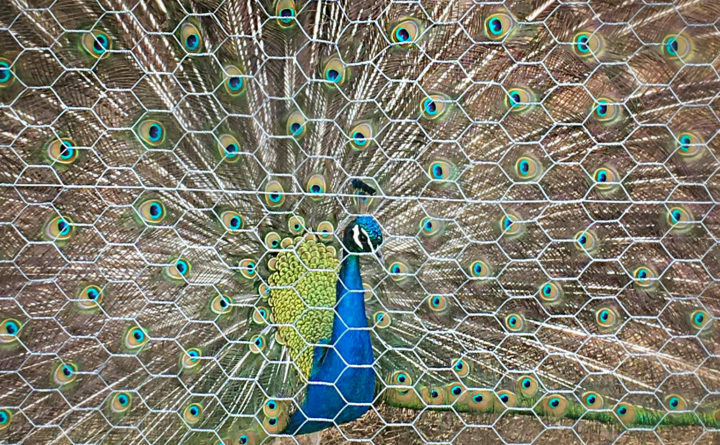 One thing that peacocks do that can be especially bothersome to people is screech during mating season in the spring. 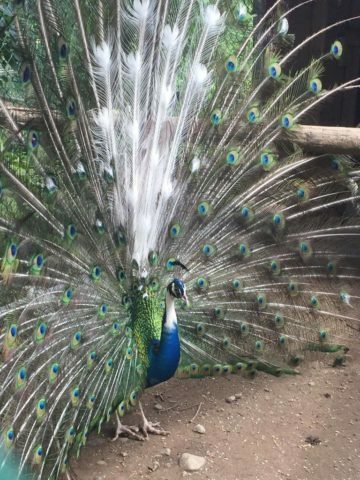 Also, first-time peafowl owners can often be discouraged by the fact that it takes three years for a peacock to fully develop its elaborate tail feathers and become sexually mature, while peahens rarely lay eggs in their first year. In addition, peacocks shed their beautiful tails in the summer after breeding season, then the long tail feathers gradually grow back over the course of about six months so that by midwinter, they’re back to having full plumage. “People get impatient and want results,” Fett said. For those who are patient and develop a love for the bird, it could be a resident on your property for quite some time. Peafowl can live to be more than 20 years old, if given the proper care. And if you’re interested in raising them, there’s few things cuter than a little peachick.